As a general life rule, I stay away from horror because I'm a massive wuss and I don't like being scared. But I decided to put the fear aside so I could read Lynne Truss's Cat Out of Hell, part of the Hammer novellas series from Arrow. And it sort of worked. After the death of his wife, a man heads to a cottage with his dog for some solace. While there he goes through a file sent to him by his dead wife's colleague/friend. In the file, among other things, are audio tapes of a story being told to a man whose sister has gone missing - a story told by a cat. And that's all I can say without spoiling it for you. 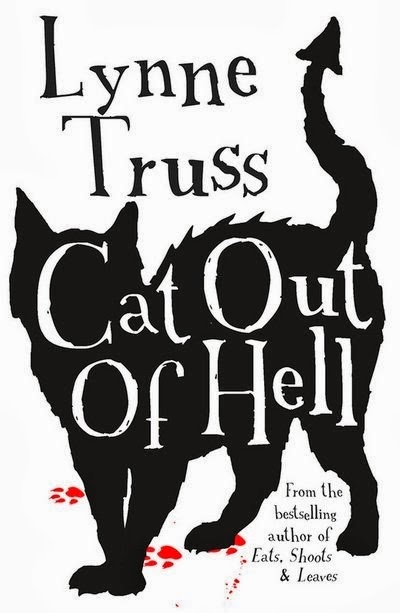 Truss uses an interesting structure for Cat Out of Hell, with the novella flipping between past, present and the very far past. Truss also employs a range of tools to tell the story, from straight narrative to emails to transcripts. It makes for good variety, and means we get to hear from a range of voices (human and not). I can't tell you with any great expertise where Cat Out of Hell fits in the oeuvre of horror novellas since my expertise of horror literature extends to a few short stories by Edgar Allen Poe and Stephen King's Misery (which terrified me). What I can say is that Cat Out of Hell made my spine tingle in the same way Poe and King's work did, which I guess is part of its aim. In addition, I made the mistake of reading Cat Out of Hell before bed, and spent the night having really weird dreams featuring cats (again, no more details because it would spoil the book). Still, even though there was some spine-tingling and some weird dreams, I didn't find Cat Out of Hell terrifying. It was freaky, but also very amusing. I think that lighter side came from the great voices. Our protagonist, the widower, finds himself in the middle of a very strange situation, but still has time to act very, very human - he gets exasperated over the difficulties of unpacking after being away, he is annoyed by things very easily, and he's pretty judgmental when he wants to be. In addition to him, Wiggy is also a hilarious character, who seems to be from another planet half the time, but whose value to the story is clear from the very beginning (even if he does come across as a bit dim). And then there's Roger, who is a wonderful, compelling character. Gothic and fun, witty and clever, Cat Out of Hell is a short, sweet read. Perfect for fans of horror, it's something that even cowards like me can enjoy. Just don't read it before bed. How I got this book: From the publisher, Arrow. This did not affect my review.